New authors often think it is so easy to self-publish with a publishing service such as Kindle Direct Publishing (KDP), Smashwords or Draft2Digital. It is true that uploading and publishing a Microsoft Word file and a quick homemade book cover is insanely fast and straightforward. You can do it in under five minutes and have your book published and on sale in less than twenty-four hours. On top of that, you can do it all for free. That might be a great thing, but how many books and ebooks do new authors sell? Perhaps a few to friends and family, and then what? New self-published authors rarely succeed in selling books. The publishing industry, and book marketing, in particular, is a tough business. To stand any chance of publishing a successful story, self-help book or nonfiction title, a new Indie author must think like a traditional publisher. Publishing companies go through a long process to prepare a book for release. The process and methods are the same for an Indie author, except that you have to do everything yourself. Writing and then immediately publishing miss so many steps in the production process and this is where all the problems and mistakes occur. The result is almost always a sub-standard book that no one wants to buy. Here are the fifteen of the most common self-publishing problems, mistakes, blunders and ommissions in the process that you need to avoid. If you are not having the success you would like, you can always do better. 1. Did you do any market research and analysis? 2. Is your book cover design poor? 3. Did you get adequate editing help? 4. Did you use beta readers? 5. Did you complete meticulous proofreading? 6. Did you spend enough time on book formatting? 7. Did you write a quick book description? 8. Did you research your category and keyword selection? 9. 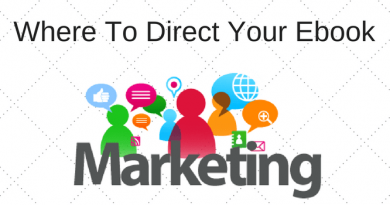 Did you have a marketing plan? 10. Did you set up your Amazon Author Page? 11. Did you only publish one version? 12. Are you only using one book retailer? 13. Is your book price realistic? 14. Did you have terribly bad timing? 15. Did you give up? It is always the best way to fail. Who will buy your book? Do you have any idea? The idea that my book is for everyone is a common misconception. Book buyers are incredibly fussy and are only attracted to books in their preferred genres. You stand no chance of selling a story about World War II or a Sci-fi Space Opera to an avid reader of Regency romance. Taking the time to think about the demographics of potential readers for your book has enormous advantages. Firstly, you can check competitive titles in your genre and find out what readers like the best. Look at the book reviews to find out how readers think, and in particular, what they like and don’t like. You can then perhaps adapt your manuscript a little to their taste. Secondly, you can focus your book marketing much better. What age group are my potential readers? Is my genre gender specific? What social media network world these readers likely use? Instagram for the young or Facebook for mature readers? Does my story have a political angle? Maybe Twitter would be a possible way to find readers. Understanding who is going to consider buying your book and why they might buy it can make a massive difference to your chances of success. Nothing kills a book’s selling potential on online retailers faster than an awful cover. Cheap always looks cheap. The quality, design, clarity, sharpness, colour and font choices and overall appeal of a book cover all have a direct effect on book sales. You might think that making your own homemade book cover will save you a few dollars, but it will never help you make money. So it is wasted energy and poor business logic. If you spend money on nothing else, always get a professional on the job and hire a book cover designer for your ebook and print on demand (POD) covers. Related reading: Does Your Book Cover Work For You In Thumbnail Size? It is not easy for an Indie author to afford a developmental editor. But having access to someone who can point out weaknesses in your story is a vital part of the process of refining a manuscript. It is not the role of beta readers. You need someone you can trust who can tell you when something doesn’t make sense or is missing essential information. Someone who can tell you that chapter one has to go because it is only scene-setting waffle and you need to get into the story immediately. Never publish a book that no one other than you the author has read. Never, never do it. Without honest feedback, there is no way you can improve your manuscript. It is hard to find beta readers, but it is a necessity. Another reason that beta readers are vitally important is that they will be the ones to write your first book reviews. Publishing a new book with no reviews, and hoping that they will come along in time, is a wish and not a plan. Plans often work but wishes never do. It takes a long time to produce a perfect manuscript. Copy editors are very expensive, so most authors opt to do much of the work themselves. You can help yourself enormously by using a quality writing correction and assessment tool to start the process. A lot of writers use Grammarly, which is a fantastic tool for online writing. 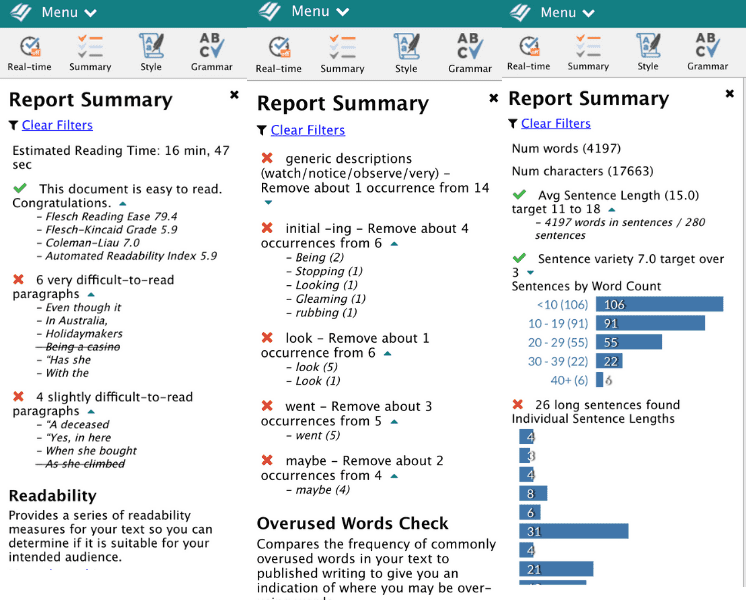 But ProWritingAid is a much better choice for authors because it gives you deeper analysis and more detailed reports on over twenty aspects of your writing. It is a very affordable tool too and can help you find many, many ways to improve your text. It will locate grammatical errors, spelling mistakes and typos, but also check for sentence length, overused words and readability. Take a look at this short video for more details. It will save you a lot of time and make the final stage of human proofreading easier and faster. But don’t skip that last stage. No matter what tools you use, you have to perform thorough human proofreading before you publish. Preferably by at least two people. Nothing is more annoying for a reader than poor text formatting in an ebook or book. Take the time to make sure you format your text perfectly for ebook publication and again for POD books. You need to take extra care for books including images. You can read more about formatting in these articles. It is easy to see when a book description is an afterthought and only written at the time of publishing. Always write your book description with a great amount of thought. Remember, it is second only to your cover in getting a book buyer to consider your book. Your description must tell the reader why they will love it and buy it. It is your sales pitch, so pitch as well as you can. You usually have up to 4,000 characters available, so use it. It is not easy to write a great book description, so it needs work. But quickly tapping out one or two sentences is not a book description. Most book purchases are made by readers searching Amazon or other book retailers. Search is the most powerful way to sell books, but most self-publishing problems arise because authors never give it any serious consideration. When you publish, you are asked to select two genre categories and seven search keywords. If you make your selection on the spur of the moment when you publish, you will achieve nothing from them. You can only leverage sales by doing detailed research for the best and least competitive categories and keywords for your book. You can do your keyword research using Amazon or Google, but the best way is to have access to real-time Amazon buyer data. 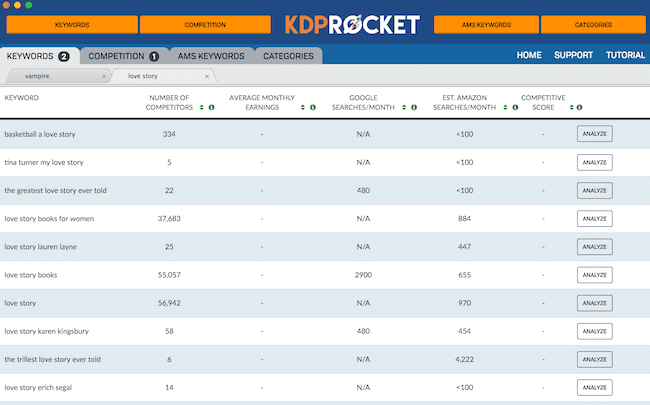 The tool used by many authors is KDP Rocket. It gives you access to the data you need to decide which categories and keywords will help your book sales. Another aspect to consider is book titles. Is your title keyword rich and useful for retail and online user search? Take your time before deciding on your book title and do your research. Thinking about marketing and promoting your book after you publish is putting the cart before the horse. You need to identify your potential readers and then make a plan about how you can get your book in front of their noses. Book marketing has many aspects. There is content marketing via blogging, social media campaigns, paid and free advertising as well as selecting online book promotion just to name a few. Have you started to build an email address mailing list? Recommended reading: What’s The Best Way To Promote My Self-Published Book? If you haven’t set up your Amazon Author Page on Author Central, you are missing out on a host of book and author promotion opportunities. You can extend your book description, add editorial reviews, add your blog feed and set a follow button for Amazon buyers. Take the time to set up your page correctly, and fully. You can also add an author page on international Amazon stores in the UK, Germany, France and Japan. Read the how-to article below for full details. Publishing an ebook is fast. But publishing a print on demand book opens up your sales chances. Not all readers love ebooks. Another benefit is that by publishing a print or audio version it extends your potential discovery by User Search. Remember the importance of your categories and keywords? Well, you can use more because each version can have different categories and keywords. It is a decision every new author has to make. Do you publish exclusively with KDP Select, or open publish and make your ebooks available on Apple, B&N and Kobo. It is not an easy decision to make. The best advice is to consider what option will work best for you and the type of book you are publishing. It would be great if readers would willingly pay $50.00 for an ebook, wouldn’t it? Well, in the real world it will never happen. Books are price sensitive so your book pricing needs to be realistic and within market expectations. For a digital book, the best price points are between $0.99 and $3.99. For a paperback print books, between $8.00 – $14.00. Trying to sell your book at a price above the market will not help you sell books or make money. Yes, it was hard work writing a book, and your time should be worth more. But the reality of the book buying market today for author earnings dictates what price and return you can get. Are you running a bit late on getting your book out? Well, if it was a children’s Christmas story, and it’s now early February, then you missed the bus. Wait until October before you publish. Have you written a book about a current political event, politician or celebrity? But you now find out that they have become yesterday’s news, or have been charged with a crime or sent to prison? Writing about current trending topics is always prone to go out of date quickly. Your book will almost always date very fast. If you don’t get a huge rush of sales in the first couple of months, you will have missed your time. You can only expect sales to fall away very quickly after that. It is a long process to write and publish a book. There will be times when you are tired, lazy or fed-up. It’s a tough job being an independent author. But writers and authors like you can and do succeed. So don’t give up on your project too soon. Take a break from it and come back to it refreshed and ready to go again. Self-publishing is not a two-step process of writing and then immediately publishing. There are many more steps involved in bringing your book to market and having a chance of success. If you can complete all the necessary steps before you publish, you will at least know that book buyers will get value for their money when they buy and read your book. Yup, that’s the way it is. Not new but well put together for all the newbies and wannabes. LOL. Great blog! Thanks for sharing. I have always thought I would go the traditional route, but I have been considering ebooks over the last 6 months. Yep. I have decided that for me, editing includes chopping chapter 1, and possibly chapter 2, every time I get around to the late versions of each draft! But at least I know that now. I wrote a book and need help with my book. I wrote my book with my hands.It’s not typed.